Grace Visconti is a Certified Shiatsu Practitioner and Shiatsu Master where she received her shiatsu training from Kensen Saito of the Shiatsu Academy of Tokyo, in Toronto, ON Canada from 1991-1992. Also, she took a special seminar with Tokujiro Namikoshi’s son, Toru Namikoshi, who traveled extensively worldwide to reinforce traditional shiatsu techniques. After studying the traditional techniques of shiatsu with Kensen Saito that closely adhered to the original form conceived by Tokujiro Namikoshi, Ms. Visconti then worked at the school clinic for 6 months to practice this healing art form. Following this practicum, she went on to work with chronic pain patients at The Krispin Centre in Toronto which was associated with the Canadian Chronic Pain Association. She continued to work out of her home and onsite giving treatments to those in need and also assisted with students and graduates at various shiatsu demonstrations produced by the Shiatsu Academy of Tokyo. In 1995, she participated in the 12th International Shiatsu Congress held in Toronto where Tokujiro Namikoshi was honored. 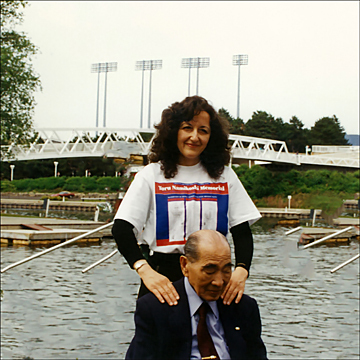 In 1996, Ms. Visconti assisted in the initiation process of regulating shiatsu in Toronto with her teacher Kensen Saito. When she was a member of the Shiatsu Diffusion Society in Ontario, Ms. Visconti designed, edited, wrote and produced the Thumbs Up for Shiatsu newsletter twice a year. Ms. Visconti is also a Registered Graphic Designer (Toronto, ON Chapter) and a published freelance magazine writer for Canada and U.S. markets. After seeing co-workers sit for many hours in front of computers, she was concerned for Graphic Designers and other professionals who suffered from computer terminal stress disorders like Carpal Tunnel Syndrome (CTS) and Repetitive Strain Injury (RSI). This prompted her to take the shiatsu course. She worked at the Holy Cross Centre as a Shiatsu Practitioner from 2001-2010, sharing her knowledge of traditional shiatsu techniques with Calgarians and now she does Mobile Shiatsu. The term Shiatsu Masters refers to graduates who have been fully and successfully trained in the technique outlined by the founder of shiatsu, Tokujiro Namikoshi. The traditional shiatsu technique is a process that involves a specific procedure where the application of shiatsu is given to clients who benefit from the thoroughness of its procedure. The title Shiatsu Masters was initially created by the Shiatsu Academy of Tokyo in Toronto, ON to classify students who have graduated from this private school. Download the Traditional Shiatsu flier here.